Sunny and 49 when we got up this morning. Well, really it wasn’t sunny because it was still dark but when the sun came up it was another beautiful cool fall day. Really enjoying this weather. Tom had our devotion again today and used Psalm 99 as the foundation. Thanks, Tom for sharing with us today and another good discussion. Everyone seem ready to go back to work this morning. 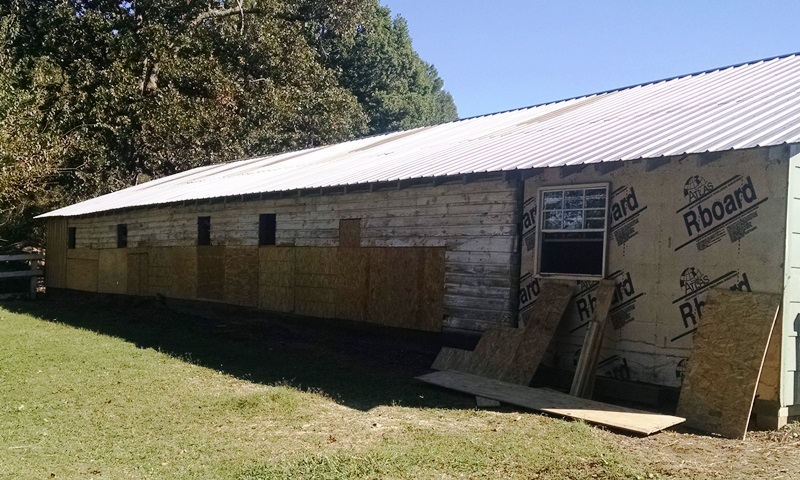 We had thought that we might wait until after morning break to resume the siding for the barn since it was so cool but the barn “crew” was ready to go and started back first thing this morning. They got as far as they could go on the north side but as they neared completion discovered they needed some longer material. They moved to the rear and started working there. However, that area took some planning before they really started making progress. Much of the work on the rear has to be done on ladders so is considerably more difficult. 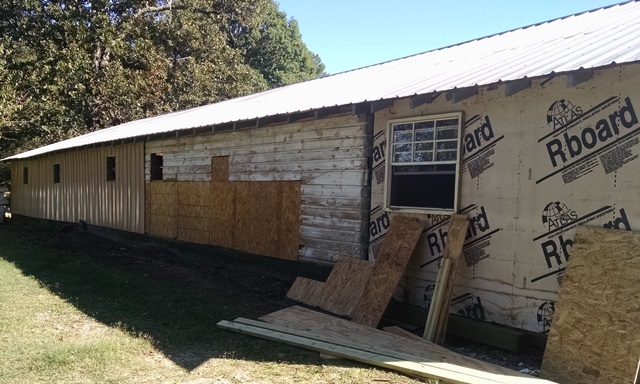 They are making good progress and now have the longer material for the remainder of the north side so tomorrow they may come close to completing the siding. 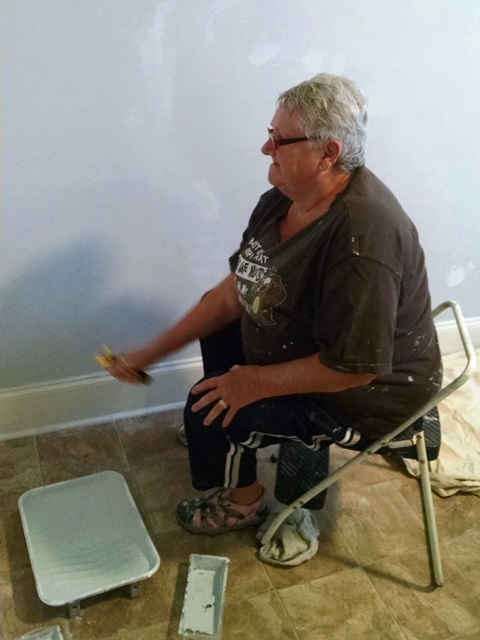 Bobbi, Cheryl, Evelyn and Anne went back to Oasis Unit to continue painting. There is just so much repair work to the walls before you can start painting. Three more rooms were completed today. The painters have started on the final room on this hall. Anne went through the rooms on the second hall with Randy today and they decided only three on the rooms on that hall needed paint. We will begin those tomorrow, after the residents have had time to remove the personal items from the walls. 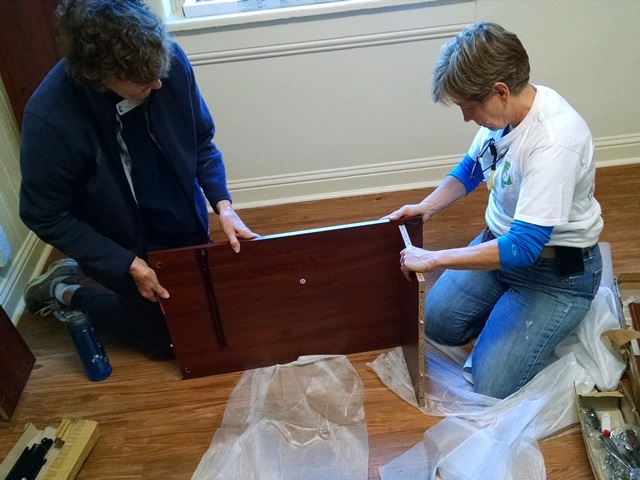 Anne and Evelyn worked on the desk project for part of the afternoon and Cheryl and Bobbie worked on cleaning in Noble. We are continuing to make progress and the kids and staff seem very appreciative. It’s sad that we needed institutions such as MHCC but it is a joy to be able to contribute in some small way to making life a little better for these kids. 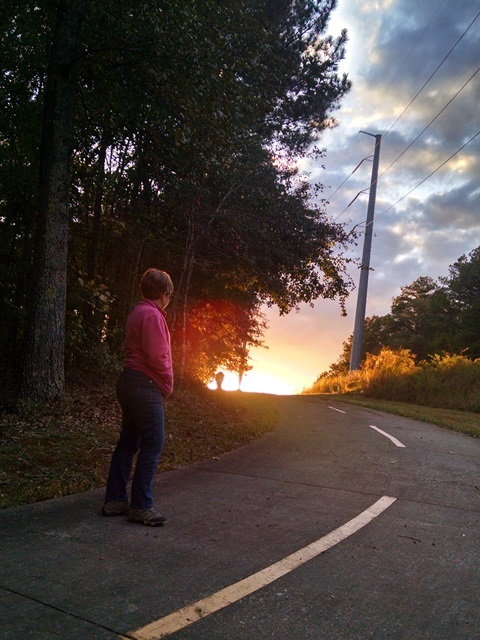 We walked a short distance on the trail after work and enjoyed a beautiful sunset. It is warming up and the humidity is going up as well. Low last night was only 57. The clouds had already started building this morning and by this afternoon it was a totally gray afternoon. No rain yet but it should be here tonight. It is very dry in Cedartown so the rain is needed. 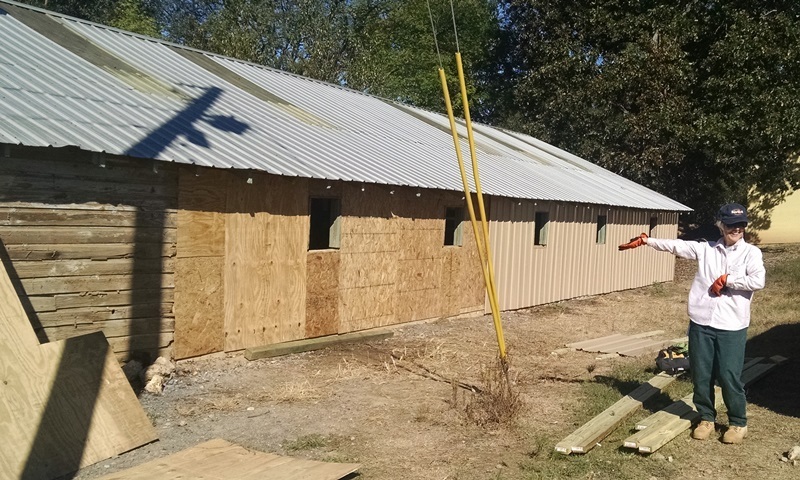 We just hope it’s just tonight and tomorrow and that we will be able to work on the barn by Tuesday. The team went to Anna Kresge Memorial UMC this morning. The congregation was very friendly and welcoming. We really enjoyed worshiping with them. Kresge was observing Laity Sunday today. For those not of the UMC heritage, Laity Sunday focuses on the celebration of the ministry of all lay Christians. 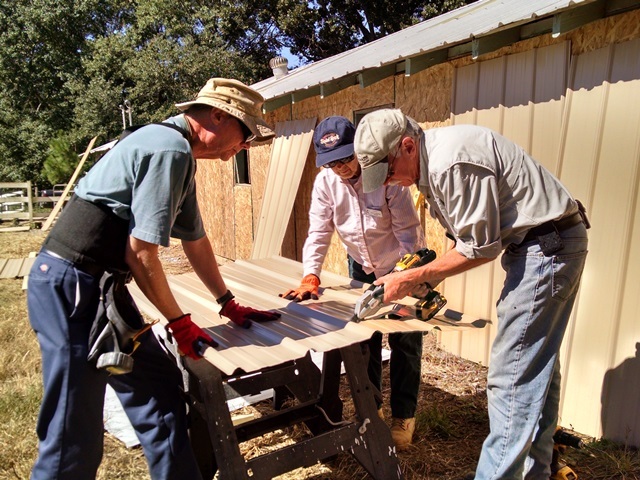 In many local churches, Laity Sunday is observed by having lay persons lead all parts of the worship service. Kresge followed the tradition and each part of the service was led by a member of the church, young, older, male, and female. It was wonderful to see the number of children in attendance for children’s church and the number of youth participating in the service, leading prayers etc. The sermon was also brought by a young lady named Alli. Today was her first day to speak before the church and she did an awesome job. 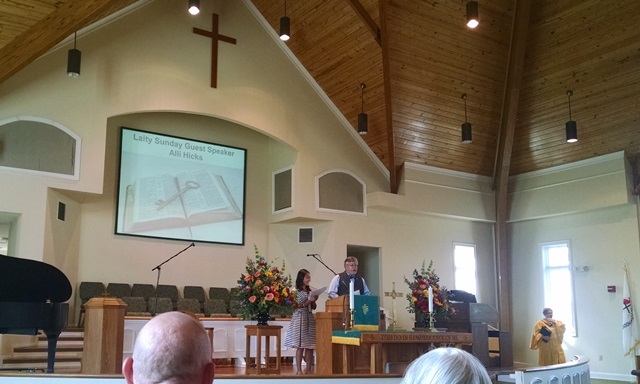 The pastor was very pleased because Alli came to him and asked to speak before she knew anything about Laity Sunday. After church there was a fundraiser lunch for a member in need, and we were invited to attend. Well, of course we stayed for dinner. It was loaded nachos plus various fruits and desserts. Very good. Thanks to Susan (a MHCC staff member) for the invitation to your church and to lunch. After church we came home for a quiet afternoon, naps, and then, rather than ride bikes today we walked the Silver Comet. You definitely use different muscles riding the bike and we figured those muscles needed a break so we hiked a little over five miles. Love being able to get out like this. We are in such a great setting and we get to enjoy it for two more weeks. Again, feeling really blessed. Hope you have had a great weekend and stay safe this week. 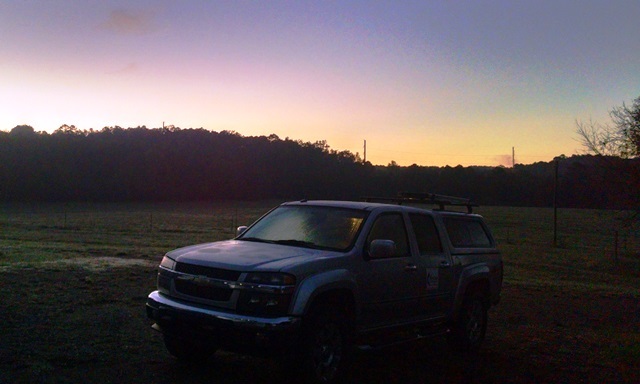 The low last night was 47 so not as cold but really heavy dew this morning. You just couldn’t ask for a more beautiful early fall day. The leaves are turning a little but there is still a lot of green in the woods of Georgia. We fixed ourselves a hearty breakfast in preparation for our long (for us) bike ride today. We headed out at 9:30 riding the Silver Comet to Alabama. It’s about 11.5 miles from our campground. It was still a little cool when we started and we were thankful we had decided to put on long sleeves. 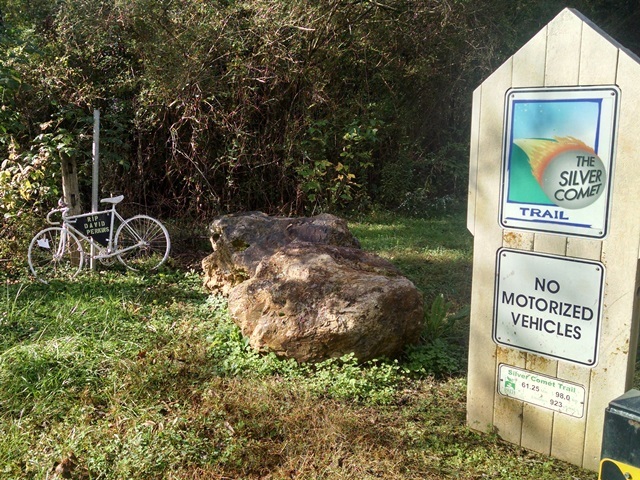 We didn’t see very many other cyclists on the way to Alabama. 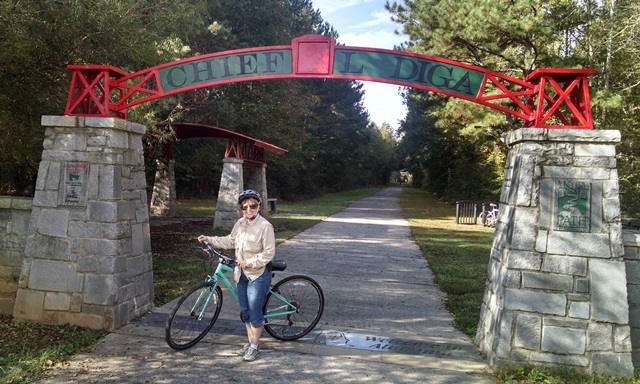 When we got to the end of the SCT and the beginning of the Chief Ladiga Trail in Alabama we met some other cyclists and talked for a while, while we were all taking a break. Met some interesting people. After a break we were on the way back to the campground. We met many more people on the way back. 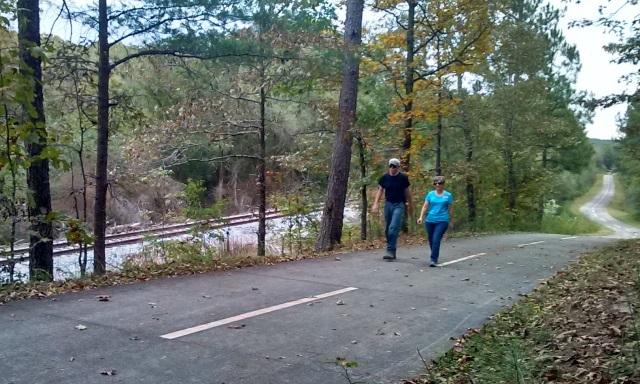 There was a Boy Scout troop riding the trail today. They were strung out for quite a ways and the troop leaders seemed to have there hands full. We also did some geocaching along the way. It was a really nice ride 22.5 miles per the GPS. 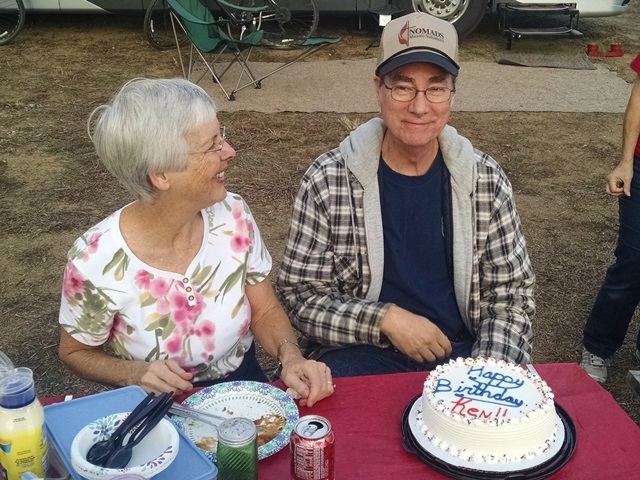 After returning we quickly headed into town to pick up a few groceries and get an ice cream cake for Ken. His birthday was Monday, but we decided to wait until today to celebrate. 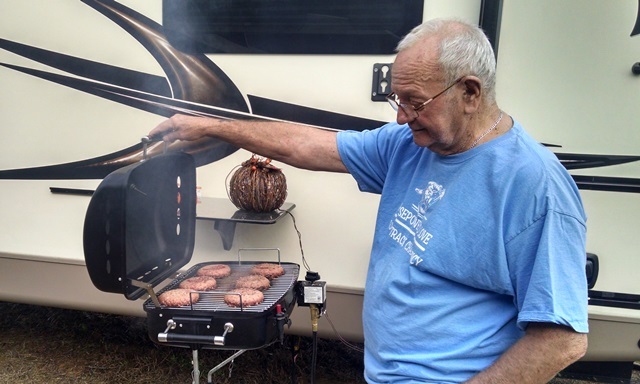 We got some really nice burgers from the food truck Monday and Don and Joyce grilled those for us tonight. Others prepared slaw, baked beans, macaroni salad, stuffed eggs and chips with ice cream cake for dessert. We all enjoyed a nice meal together and then sat around the fire that Max had built for us earlier this afternoon. 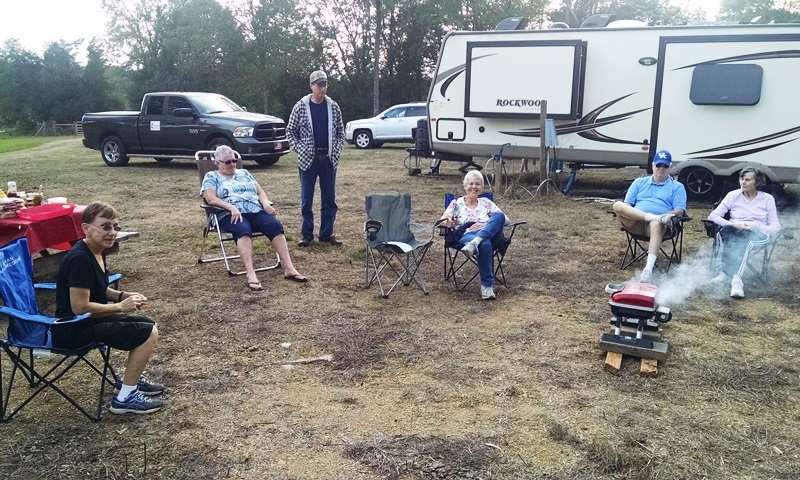 It was a nice time of talking, relaxing and enjoying the cool fall evening. It was another wonderful day. Looking forward to visiting Anna Kresge UMC here in Cedartown tomorrow with the team. The low last night was 40. Don’t know what the truck thermometer indicated or if there was more ice this morning because we were still in bed. When we did get up and look out it appeared everyone else was having a slow start to the day too. Nice! It was a quiet, slow day. We washed clothes, cleaned house, did a little work. With the work done, we sat outside enjoying the beautiful afternoon and visiting with our friends. 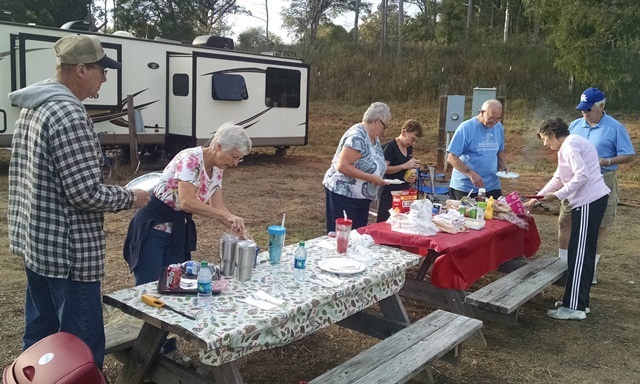 Some of the group went shopping, but we never left the campground until late afternoon when we did another ten miles on the Silver Comet. Another nice ride. It would really be nice to have a trail like this close to home. 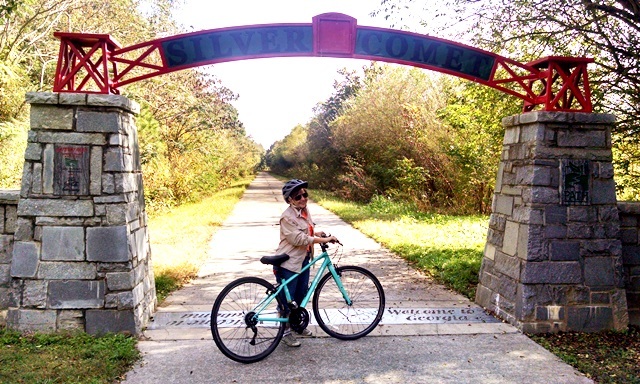 If we ever move we think we will look for a bike friendly community with good weather. 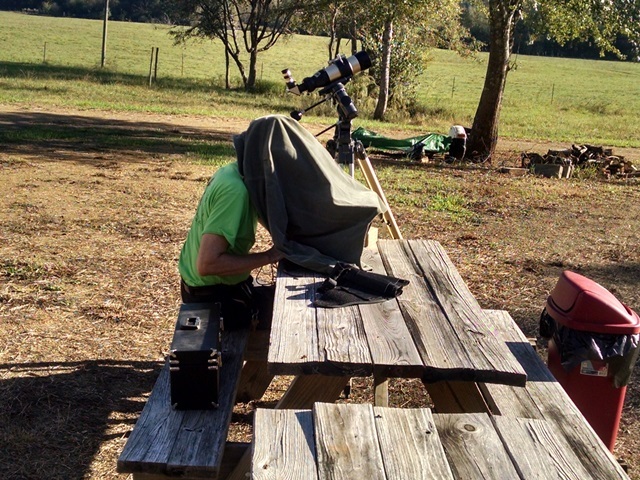 Before the bike ride, Ken got his solar telescope out again. There was another filament, sun spot and prominence in view. It was another awesome fall day. We are feeling very blessed. Another day like yesterday except it felt colder with more ice on the windshield. Truck had temp of 37 again. Official low of 41. It took longer to warm up today. But another beautiful day. Bobbi had devotion this morning. She used a devotion from Charles Stanley. Bobbie reminded us that our spiritual preparation for all that we do should be prayer, quiet time and accountability. She also reminded us that God has prepared us and will equip us for what he has for us to do in the world. Thanks, Bobbi, for sharing with us today. 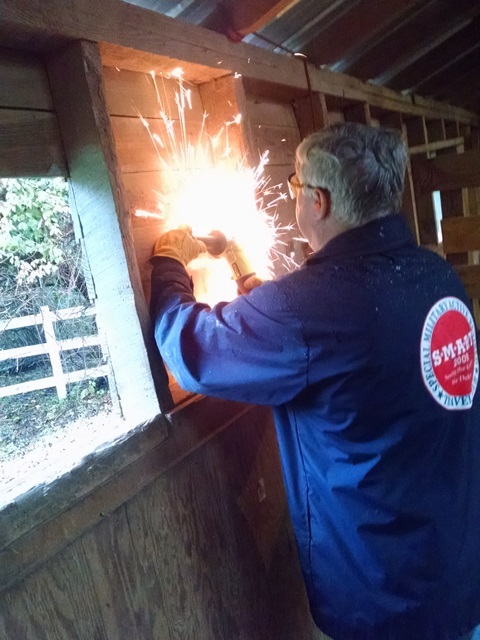 It was back to the barn (or stable, Tom says) for Max, Ken, Tom, Don and Joyce. 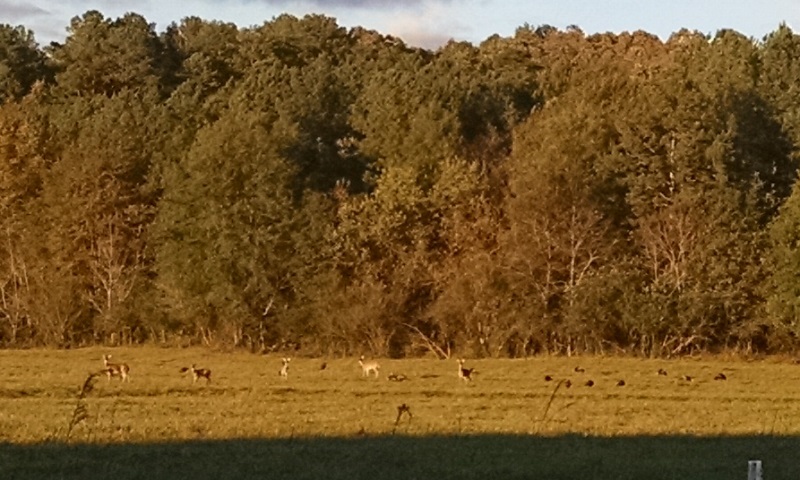 They all worked on the south side this morning so they could be in the sun. The north side was totally in the shade and too cold. 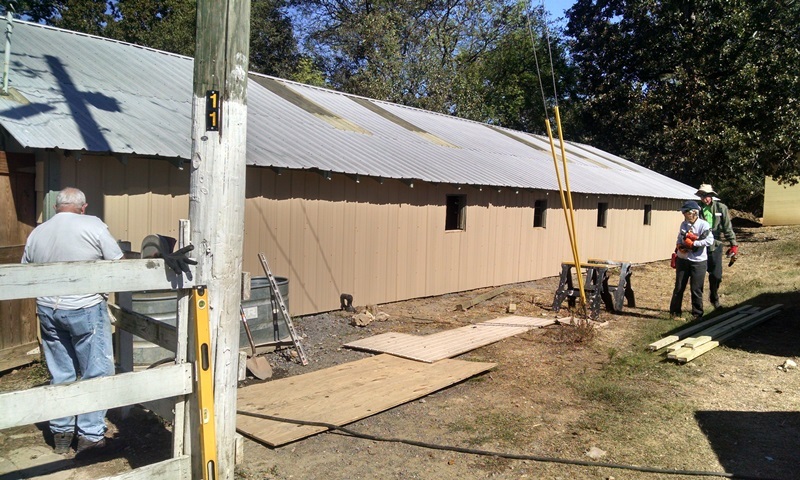 The completed the metal siding on the south side today and about half of the north side. The forecast is for rain Monday and Tuesday so we may not get back to the barn until later next week. 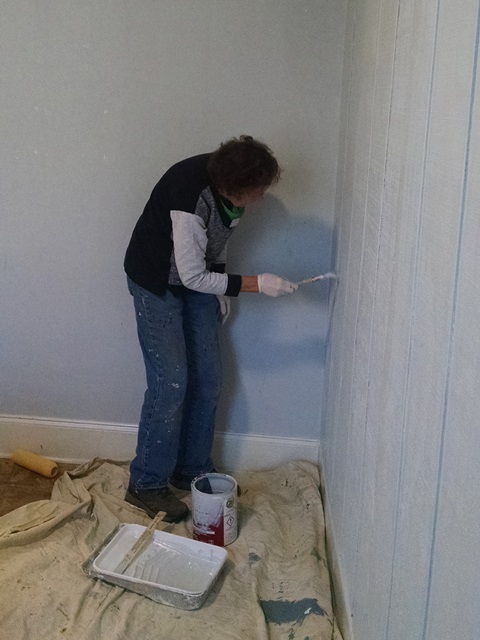 Evelyn, Cheryl, Bobbi and Anne worked in the Oasis unit again today, cleaning, removing tape, patching the walls then priming and painting. 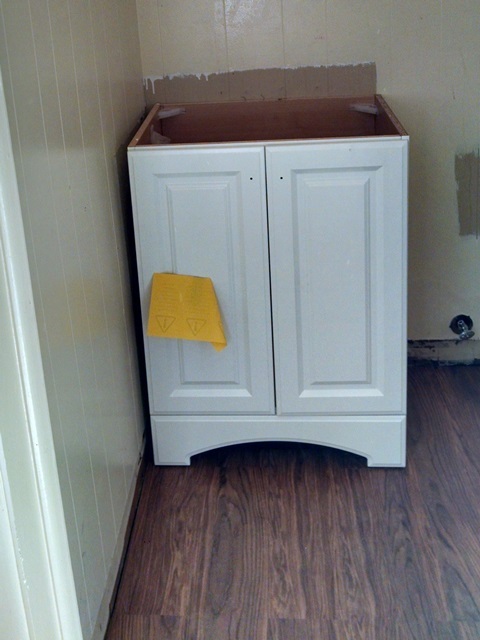 Another room was completed, (that makes a total of two) and two others are in process. Since this is our last day of work this week, we spent a little additional time cleaning everything up today and cleaning the Guest House. We had a very productive week, accomplishing more than the agency expected. The team has really come together. Everyone is looking forward to a little rest and some fun this weekend. After work Ken set up his solar telescope and let us all look at the sun. He was excited at finding a large solar prominence. He said it was the largest he has ever seen. It was really cool to see. It looked sort of like a little bush coming out the side of the sun. 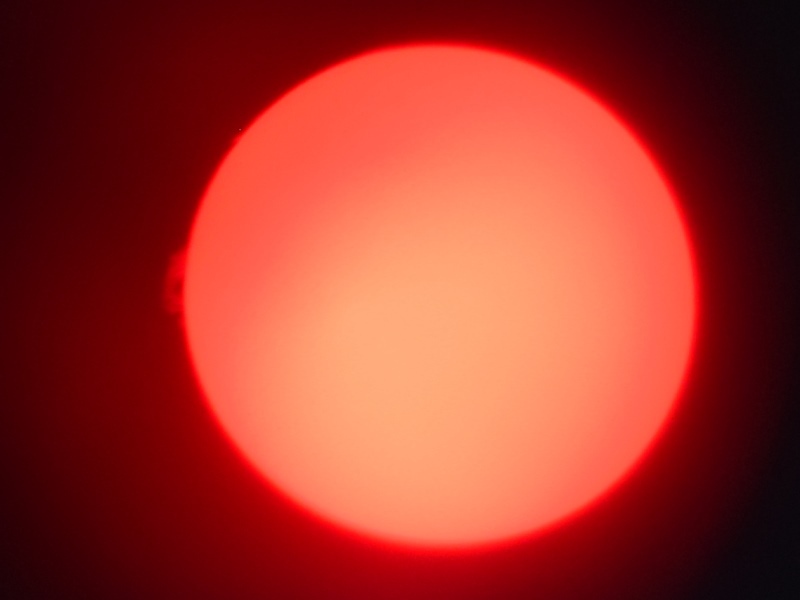 Ken then hooked his computer to the telescope and was able to capture video of the prominence. It was really interesting the view the video as well. 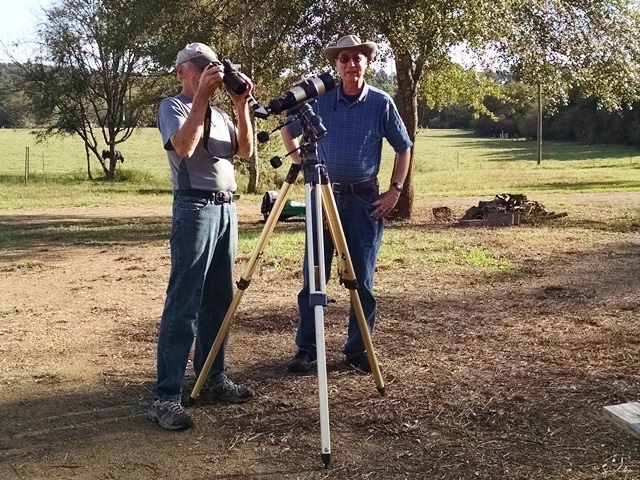 Thanks Ken for being so willing to share your knowledge and passion for astronomy. 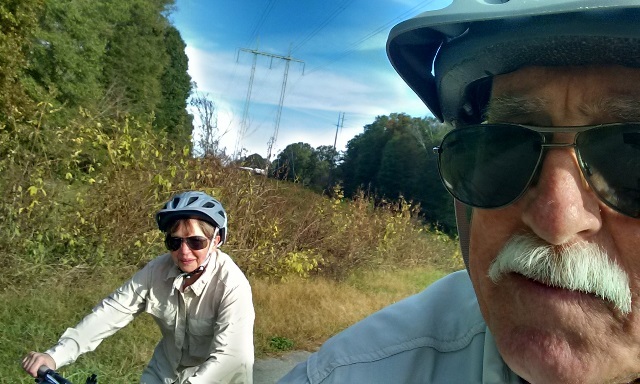 Shortly before dark, we went for another bike ride, but since we are planning a twenty mile trip tomorrow or Saturday, we took a light day and did about 6 miles through Cedartown on the Silver Comet Trail. Love this trail! Today was a copy of yesterday only colder this morning. 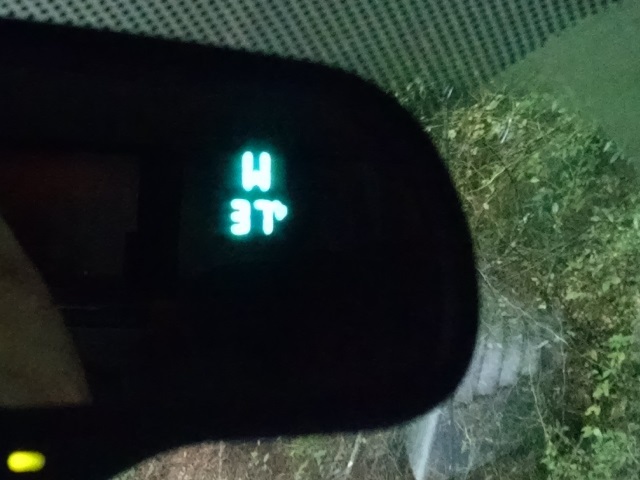 The truck thermometer indicated 37 this morning. And we had ice on the windshield for the first time since last winter. The official low was 45, but we are down in a valley so the truck was probably pretty accurate for our area. Another beautiful fall day. Ken and Joyce had our devotion this morning. They used a devotional book “The Upper Room Disciplines”. 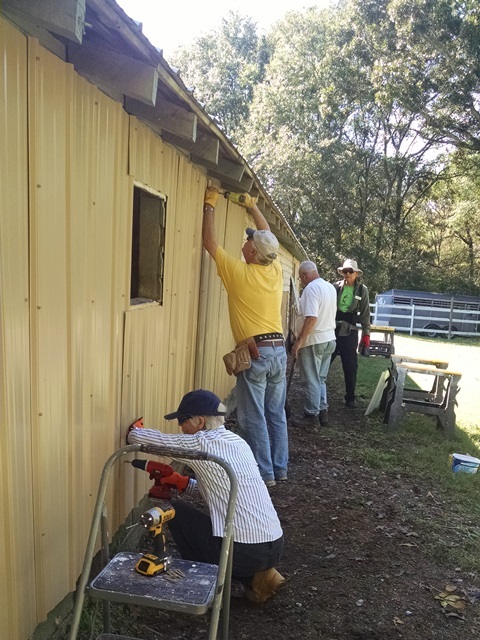 It was about servant leadership and of course Christ was the prime example of that. Again we had good discussion. Thanks, Ken and Joyce. We really feel like our devotion time is the most important time of our day and the foundation for all we do. We split up even more today. 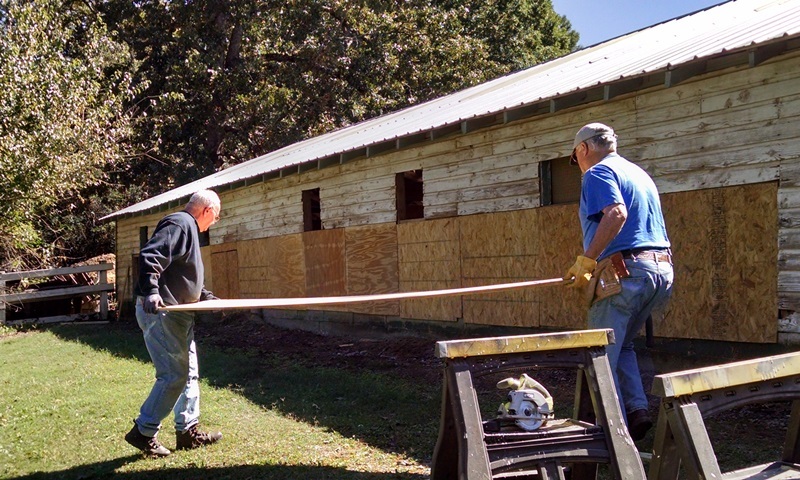 Ken, Don and Tom worked at the barn this morning, continuing the OSB installation. 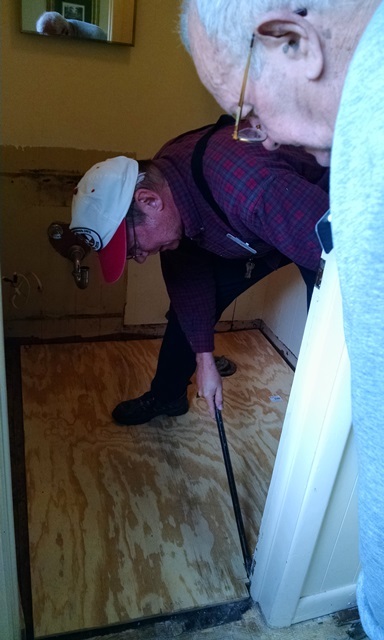 Max assisted Joyce in removing another layer of subfloor in bathroom at Noble while Cheryl did some cleaning in the front room. 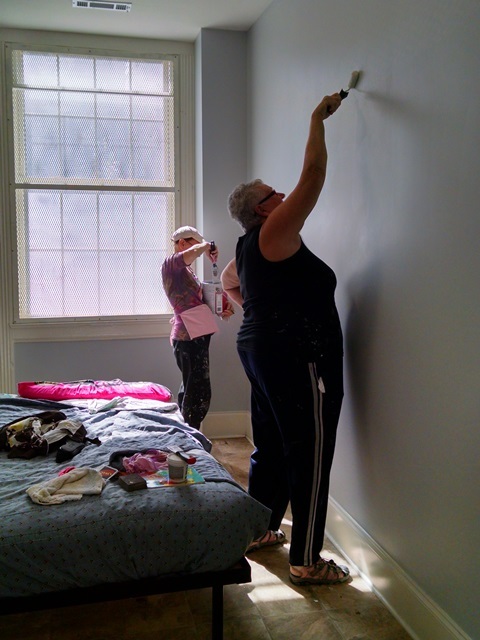 Anne took Bobbi and Evelyn to Pfiepher Hall first floor to begin painting some rooms. The first floor has the Oasis unit, an area where newer residents are housed. 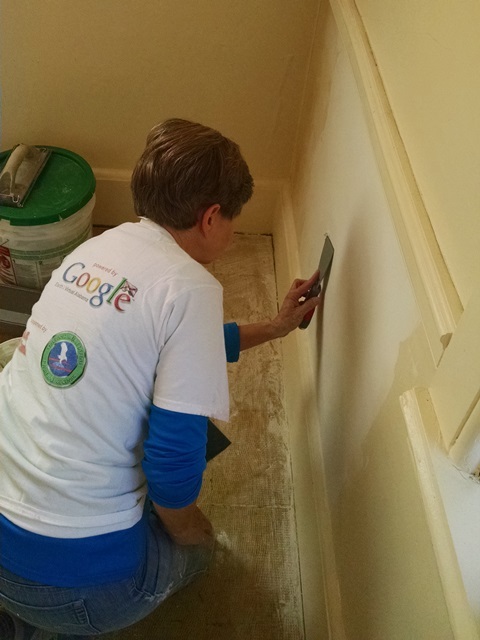 We are painting some of the girls rooms. 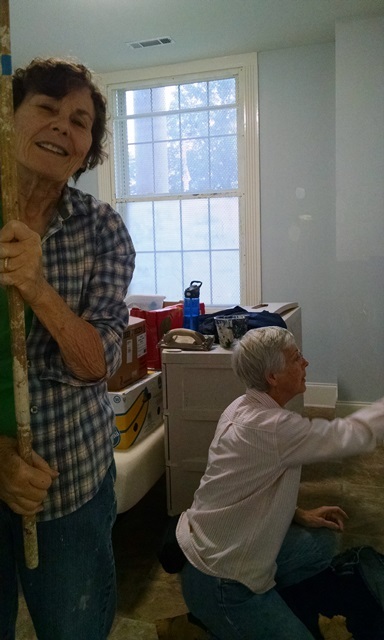 Anne helped get Evelyn and Bobbi started then returned to Noble to work some more on the plaster repair. 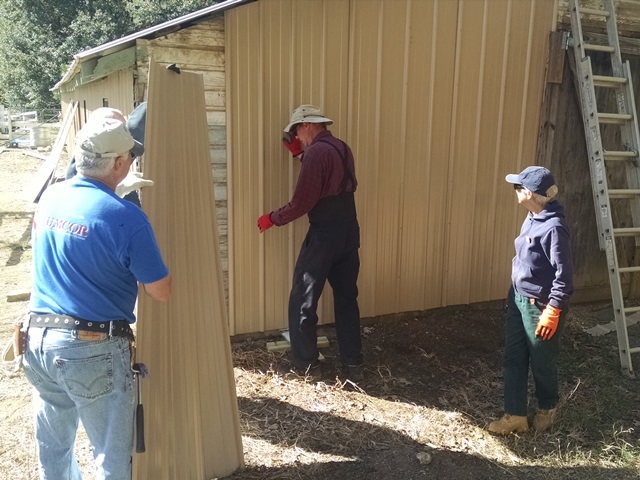 After the subfloor was removed, cleaning complete and another layer of mud was applied, Joyce and Max went back to the barn, Cheryl to paint and Anne acted more as a gopher. It was a busy day. 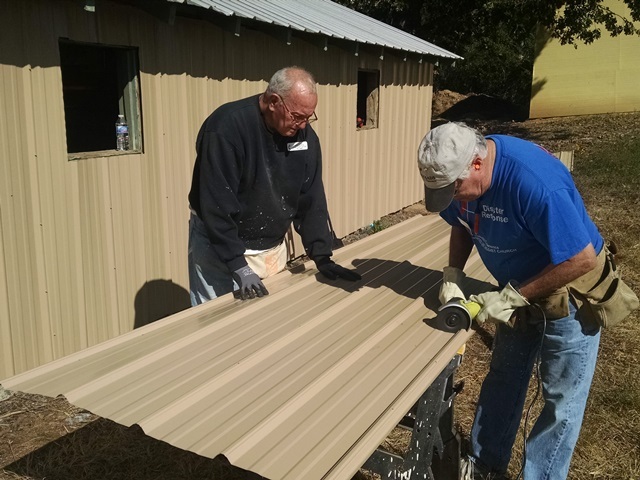 Don and Tim completed the OSB on the barn. 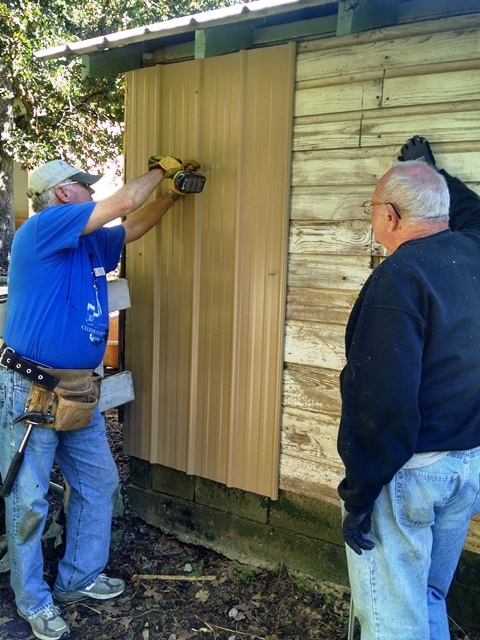 Then the entire barn crew worked on the metal siding. 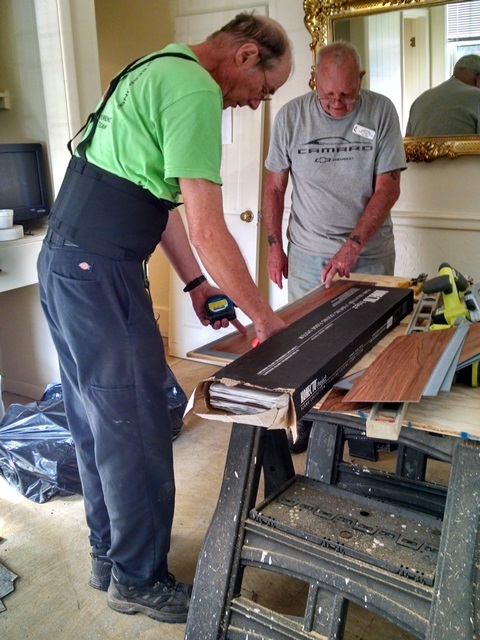 It is actually the metal you would use on a roof but we are hanging it vertically to cover the OSB. We think it is looking pretty good. The ladies must stop in Oasis about 1:30 when the girls start returning from school, but they basically completed one room today. It was another productive day. After work Anne wasn’t feeling well so she rested while Max rode another nine miles on the SCT. We are all tired but tomorrow is NOMADS Friday!